Volunteer of the Year 2011 « PC Users Group (ACT) Inc.
Eleanor Whelan was awarded the Volunteer of the Year award for 2011. 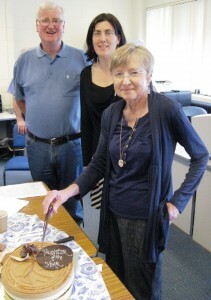 Due to be presented at the 2011 AGM, the award announcement was deferred due to Eleanor being unavailable on the night. The award was presented at Eleanor’s Beginners’ Special Interest Group by PCUG Secretary Lawrie Brown, on Thursday 27 October, 2011. Gordon states “I would like to nominate Eleanor Whelan for this award. Eleanor has been crucial to the success of the ABC Course [Absolute Beginners Computing] and has attended all sessions. She is the head Trainer, Emails homework to all participants & Prints all documentation.